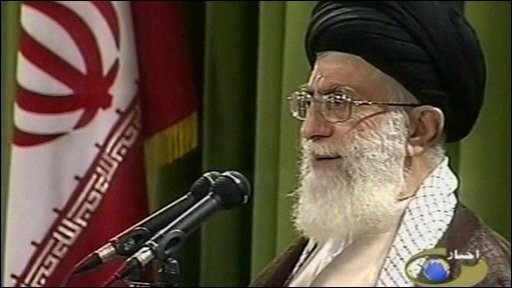 Iran's supreme leader has said the nation "will not yield to pressure" over a disputed presidential election. Ayatollah Ali Khamenei again said the result would stand, despite protests in which several people have died. The main protest leader, Mir Hossein Mousavi, has not been seen in public for days, but his website quoted his wife saying protests would continue. Eyewitness reports said about 200 protesters had tried to gather in central Tehran on Wednesday. The Iranian news channel Press TV reported that they had been dispersed by security forces. It said the gathering, in Baharestan Square, had been planned in advance and there was a heavy police presence. Severe reporting restrictions placed on the BBC and other foreign media mean many reports from the country cannot be verified independently. On Mr Mousavi's website, his wife Zahra Rahnavard was also quoted as demanding the release of people detained since the election, who include 25 employees of her husband's newspaper. "It is my duty to continue legal protests to preserve Iranian rights," she was quoted as saying on the website. At least 17 people have been killed in street protests since the 12 June poll returned President Mahmoud Ahmadinejad to power. Mr Mousavi alleges the election was rigged, and is demanding a re-run. In other developments, another defeated candidate, the moderate Mehdi Karoubi, reportedly denounced the new government as "illegitimate", Reuters reported on Wednesday. "I do not accept the result and therefore consider as illegitimate the new government. Because of the irregularities, the vote should be annulled," he is quoted as saying on his website. Iran, which has blamed foreign governments for inflaming the protests, has said it is "reviewing" whether to downgrade relations with the UK as diplomatic tensions between the two countries increased. London has moved to expel two Iranian diplomats in response to Tehran's decision to order two UK diplomats to leave Iran. A spokesman for British Prime Minister Gordon Brown said Downing Street was monitoring the situation. "Iran's decision to try to turn what are clearly internal matters for Iran into a conflict with the UK and others is deeply regrettable and without foundation," he said. The ayatollah, whose earlier command to stop street protests went unheeded, said: "I had insisted and will insist on implementing the law on the election issue. He added: "Neither the establishment nor the nation will yield to pressure at any cost." He had earlier agreed to extend by five days the amount of time allowed to examine complaints of electoral fraud. However, the Guardian Council, Iran's electoral body, said there was "no major fraud or breach in the election". Reports say that 25 journalists and other staff at the Kalemeh Sabz newspaper owned by Mr Mousavi had been arrested. AFP quoted one of the newspaper's editors saying that five women staff members had been released. The paper, launched in the run-up to the election, has already been shut down by authorities. Are you in Iran? What do you think of the current situation? Are you taking part in the demonstrations?